Where do some of the more obscure functional groups get their names? This is the topic for tonight’s discussion. For instance, everyone is familiar with amidines – you get them by replacing oxygen atoms with nitrogens in carboxylic acids. The properties change rather drastically, but I am not talking about them tonight. In fact, I will not even go into a protracted discussion about where amidines got their name from. There is a certain logical connection to amides here, and I am just going to leave it there. Now let’s switch the letters “m” and “d” in the name “amidine”. We are going to end up with adimines. Who are they? Maybe this name hints at some imine character? Well, despite the fact that I cannot, for the life of me, figure out the origins of adimines, these intermediates are absolutely fascinating, if rare. Take a look at the sequence shown below. The arylpyridinium salt is first hit with a hydrazine, followed by ring-closure to generate the adimine skeleton. 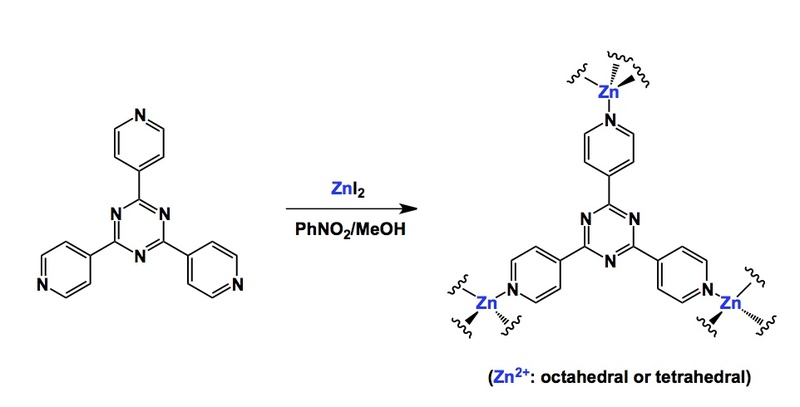 In this particular work, courtesy of Alvarez-Builla’s lab, adimine serves as a springboard into other heterocycles by way of palladium catalysis. The reactions are interesting, especially to me since I am very fond of unusual nitrogen arrangements (here we have a all-sp2 NCNN sequence, which is really rare). Of late, I have not come across too many unusual reactions that involve silicon (if you have any recent examples – do let me know), which is why I am going a couple of years back to the rescue. One of the reasons I am keen on transannular collapse processes will become evident once you will (hopefully) read the Perspective on macrocycles I am putting together for Chemical Science. Tonight, though, I am showing an eight-membered ring that undergoes a very interesting and unusual contraction to generate the cyclopropyl-containing seven-membered heterocycle shown below. When a silicon-bearing molecule is being “hit” with fluoride anions, one typically expects a fairly mundane silyl group removal. There are, of course, some really useful reactions (such as aldol processes using silyl enol ethers) that accompany the process of desilylation. 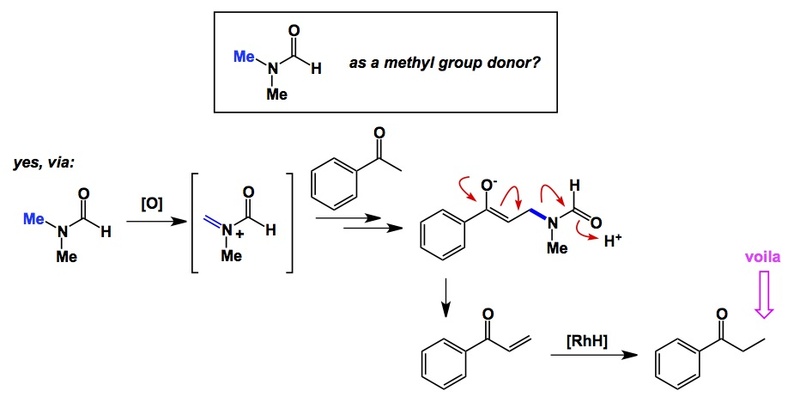 Here is a good example that is unusual in terms of what goes in the course of desilylation. According to this report by Dowden and coworkers, clean “ablation” of the trimethylsilyl group from the eight-membered ring triggers conjugate addition and generates the cyclopropane ring that you see. What’s more, attempts to induce conjugate addition to the unsaturated amide intermolecularly (e.g. by adding thiophenol and base to the starting 8-membered ring) did not result in anything tractable. Thus, it is clear that the conformation of the 5,6-dihydroazocinone helps to guide the observed cyclopropanation. This example attests to how medium sized rings are full of surprizing features when it comes to uncommon reactivity patterns such as transannular ring formation. 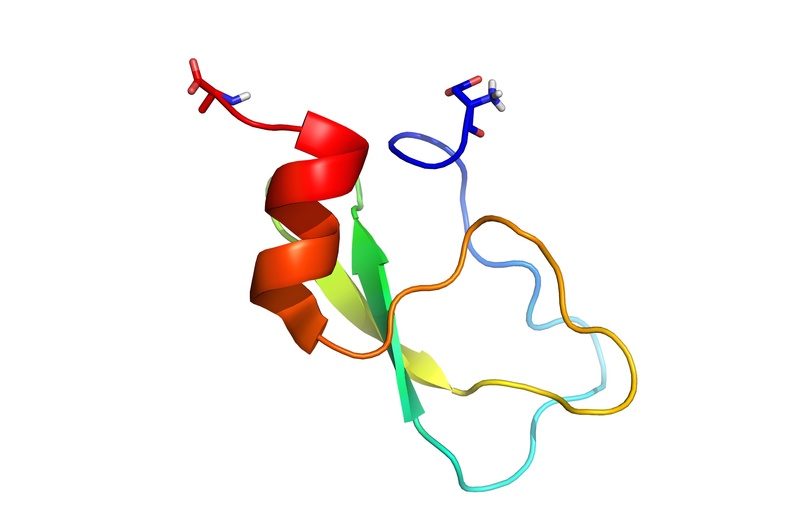 Cyclic enzymes – how rare is that? Now, if we go 30 years back, we would find a classic study by Creighton, which showed a clean cyclization of the BPTI protein (its structure is shown below). Remarkably, the cyclization was triggered by a “middle of the road” carbodiimide reagent, so there is nothing fancy in this chemistry. 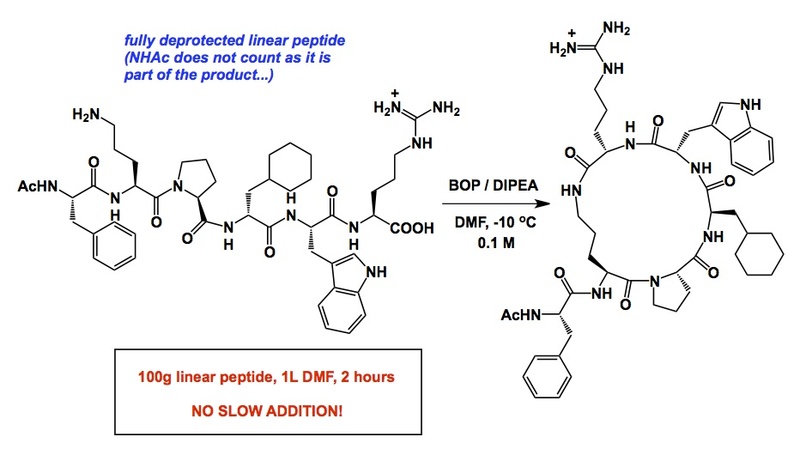 In the graphic below you can clearly see that the ends of BPTI are fairly close to each other and can be forced to cyclize without much trouble. When it comes to making cyclic peptides, we have a tendency to recall all sorts of nightmares. Choosing the right protecting group and running reactions under high dilution in order to avoid polymerization are two of the most common sources of headaches. These are presumed headaches, I must add. We know that exceptions prove the rule and I fully admit that outliers in this field probably possess some very special features. The corresponding outlier peptide would stand out as a sore thumb, challenging widely accepted views and fears. This is therapeutic to all of us. A case in point is a solution phase reaction developed by Fairlie and co-workers some years ago. This cyclization is: a. not run at high dilution, b. not associated with protecting groups, c. run over 2 hours on a 100g scale, affording 33g of the desired product. So, next time you are performing your cyclization with a laundry list of precautions in mind, think of such outliers and do not fall victim to default assumptions that dominate this field.